From the fourth grade on — when my older sister started reading books to us (her younger siblings) in the loft of the log cabin where we lived — I have been a voracious reader. My curiosity knew no bounds. I read anything and everything, and the more I read the more my curiosity grew. My love of reading led me to become well informed on dozens of different subjects. Now 52 years later, having read thousands of books about every conceivable topic, there is rarely a conversation that I cannot contribute to — regardless of what the subject is. Similarly, Native American students’ love of computer games can lead them to become proficient in math, or any other academic subject for that matter. Native American children love computer games to the point of obsession. It is this obsession with computer games that can help students become not only proficient in math, but will teach them about their culture as well. The trick is to create a math game with a balance between, amusement, math and culture so children will learn about their culture and math while having fun. For, as Indian educators, we know learning about our culture instills a sense of pride that leads to a high self-esteem for our students. This self-esteem is critical for Native American children to become successful in life. Creating that kind of game is what we here at 7 Generation have managed to do. When I tested the Beta version of Spirit Lake: The Game at Tate Topa Tribal School with the third, fourth and fifth grade students, the first thing I noticed is how the powwow songs playing softly in as the background music of the game affected them. The sound made them feel good. Here was a genuine math computer game, using powwow music, a part of their heritage – and it made the students proud to be Indian. And once they felt good about themselves, they eagerly played the game even though they were required to solve tough math equations. Learning math requires repetition and memorization, which many people find to be two of the most boring ways to learn. Older educator remember the “bonehead math” that was taught back in the day. It soured many of us against the subject. What we discovered at 7 Generation Games was that by creating a math game which, in essence, uses integrated leaning to teach math, Native American Indian students can — and do — learn math, while learning about their culture, developing positive self-esteem, and having fun in the process. Native American students don’t know enough about their heritage. They are in fact starved for knowledge of who they are and where they come from. What little they know is often negative and can dim their desire to do well in math and other subjects. By integrating cultural information throughout our math games, we found that students were more engaged and had less aversion to learning math. Which brings me to my point with this short blog: Math doesn’t have to be the only focus when you are designing an educational math game for Native American students. Dr. Longie is the team leader for 7 Generation Games’ Native culture-related content. 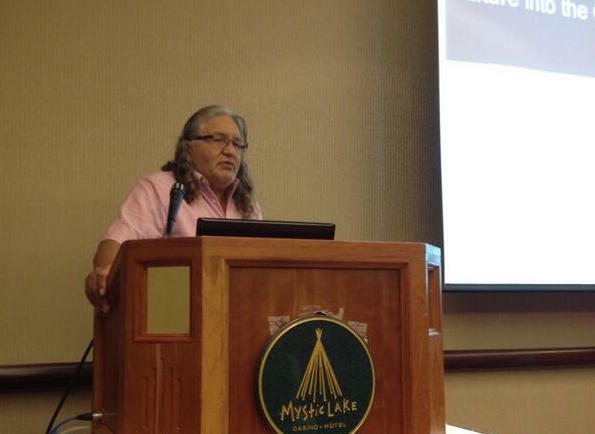 An enrolled member of the Spirit Lake Dakota, Dr. Longie is the tribe’s historic preservation officer. Dr. Longie has a doctorate in education is a longtime educator with extensive experience and expertise working with Indian students.